Since I've practiced my super-duper costing skills last time, I feel pretty confident that I'll be able to make the numbers work this time for our entry for Hobo Mondays (a Thursday Night Smackdown event). I usually go grocery-shopping twice a week, and on those runs, I keep an eye out for products that are on special. At our regular Chinese supermarket, there are two kinds of specials: one is the "Weekly Special" and the other is marked "Crazy Item". Like, you have to be crazy not to buy these things or they have to be crazy to be selling it at that price. Being shallow, I find myself giggling everytime I pass these "crazy items." I found frog legs once as a "crazy item." I resisted the urge to take a permanent marker out and write, "Hoppin' mad too!" Yes, I do keep a permanent marker in the glove compartment of my car for precisely these opportune moments. I found squids recently on weekly special. Usually, these frozen squid with tentacles sell for 4.99 a pack, a pound to a pack. We have had success with these squids, frying them up, or doing a Vietnamese/Thai-style spicy squid dish, or even stuffing them on those rare occasions. They were selling the squid for $2.99 a pack, a pound to a pack. I snatched 4 packs and froze 3 when I got home. On another run to Safeway, I spied some pasta shapes on special -- or rather, "Club Member" pricing. They were selling some shapes that were 2 packs for $6.00, so I tried looking for the shape that most appeals to me. When I figured out which shapes were on sale and which were not, it struck me as absurd why they couldn't give me the same pricing on the rigatoni and the ziti. I suppose if I argued with the customer service they might be persuaded. But, well, we don't really swing that way, that irritating-customer way. So, I grabbed the shape called "Scoobi Doo." I figure it was a good deal already, because unlike some shapes, it comes in a 900 g bag (as opposed to 500 g), and I also figure it might at least be popular with the kids. If anybody knows this pasta's real name, please inform us. I knew I wanted a pasta dish with the squid, chili, and basil. I didn't really envision having it with a tomato sauce, but we did have some oven-roasted tomatoes hanging around in our fridge so TS went ahead and used them up. Sometimes, when tomatoes are on special -- that is, going for 99 cents a pound up to 1.29 per pound -- at the produce store (because it never goes that low at our local Safeway), I will grab about 5 pounds worth of tomatoes. When the tomatoes start going the way of the unused, we will oven-roast them to preserve them. That's why we had these oven-roasted tomatoes in the fridge. For the basil, we did have to use a lot of basil and those 28 g packs costs about $2.49 each. I suppose if you could find mint, it would be cheaper. I actually wanted mint with this dish but forgot to got some mint. Mint is about 1.29 a bunch and that is a lot of mint. Parsley, another herb that could be used in this context, is 79 cents per bunch and that is also a lot of parsley. This was super simple. While the water for the pasta was boiling -- and during the pasta was cooking -- I heated some olive oil in a pan and tossed in garlic (which is a pantry staple in our house, if there ever was one), some chopped onions, and chili peppers. We had chili peppers in the fridge, but red pepper flakes is good too. Then I added some oven-roasted tomatoes and let the whole thing cook on low while I was waiting for the pasta. 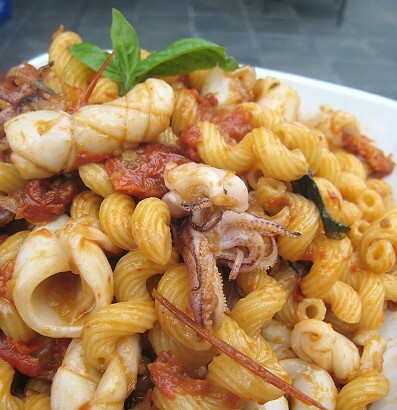 When the pasta was about a minute away from done, I turned the heat back to high and dumped the squid into the sauce. I cut the squid bodies in odd rectangular shapes and scored them this time, but rings would work too. When the pasta was ready, I added them to the sauce. I tossed everything and added the basil leaves at the last moment. This time, it was watercress, because I like the taste of watercress and they are pretty reasonably-priced. A bunch of watercress for us here costs 79 cents each (the most is 89 cents a bunch). Two bunches would serve 4 quite adequately. So this Scoobi Doo Squid-didoo pasta was pretty delicious and I'm happy to report the meal for 4 came to under 10 bucks. 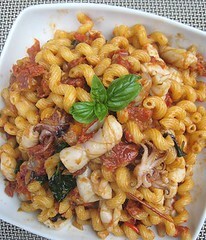 That's pasta with roasted tomatoes, squid, garlic, chili, and basil. Plus, sautéed watercress on the side! There was even some money left over to buy a baguette (assuming a baguette costs 99 cents; well, a supermarket baguette!) and serve some garlic bread. Visit Thursday Night Smackdown for all the exciting HOBO MONDAYS details! That looks really good! Kudos for budgeting too. That looks so delicious; you've inspired me to try oven-roasting tomatoes this summer. I think the pasta shape is called cavatappi; apparently in the U.S. we don't get to have whimsical names such as scoobi doo. Haha... I wonder why it came to be called that in North America. Oh, thanks! Haha... It's nice to know the REAL name of this shape. Thanks! I wonder what cavatappi means... 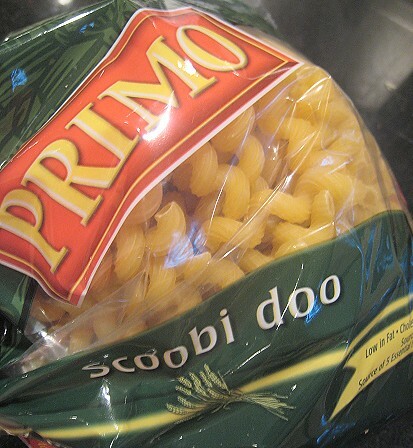 I don't even know why the sudden switch to "scoobi doo" when they name their other pasta by their Italian names. That looks insanely good - we always have Scoobis hanging around here because my little sister loves them, and since I'm the only one that'll touch squid, it will be all for me! I'm not a huuuuge fan of basil but I would half that and double the garlic for me :-). Thanks for an awesome recipe! I call this type of pasta cavatappi but I like the scooby doo name too! Great dish all around! Still feel a bit silly calling the shape "scoobi doo", hehe. 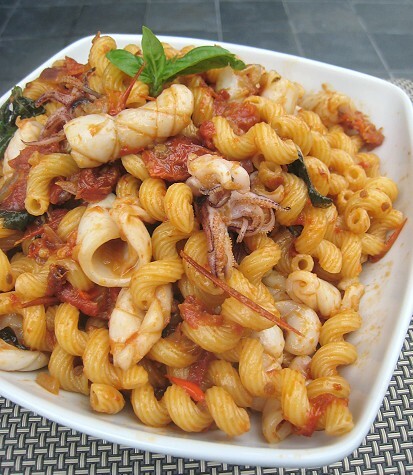 So yes, we'll start calling these cavatappi too!